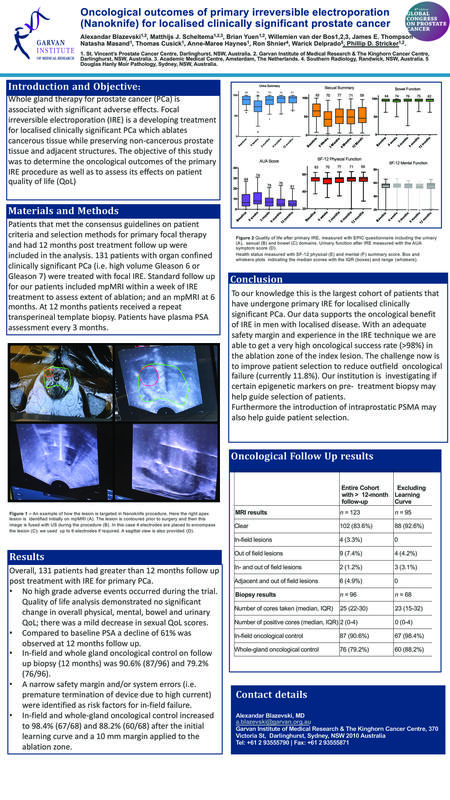 Oncological outcomes of irreversible electroporation (Nanoknife) for localised clinically significant prostate cancer at single Australian centre. Introduction and objective: Whole gland therapy for prostate cancer (PCa) is associated with significant adverse effects. Focal irreversible electroporation (IRE) is a developing treatment for localised clinically significant PCa which ablates cancerous tissue while preserving non-cancerous prostate tissue and adjacent structures. The objective of this study was to determine the oncological outcome of the primary IRE procedure. Methods: Patients who met the consensus guidelines on patient criteria and selection for primary focal therapy were eligible for analysis. Patient’s received a minimum of 12 months oncological follow up which included serial prostate-specific antigen (PSA) tests, mpMRI and repeat biopsy. Adverse events and Quality of Life (QoL) outcome data were also assessed. Results: Overall, 130 patients were included in the analysis. All patients had clinically significant PCa on pre-treatment biopsy. No high grade adverse effects occurred during the trial. Of the 130 patients, 95 had a transperineal biopsy at 12 months. In field oncological control on follow up biopsy was 94.7% (90/95), when excluding patients during the initial learning curve this increased to 98.7% (78/79). The whole prostate was clear of clinically significant PCa in 87.4% (83/95) of patients; this increased to 89.8% (71/79) when excluding the learning curve. 122 patients had multiparametric MRI at 6 months. 83.6% (102/122) had a clear MRI, 2.4% (3/122) had a suspicious lesion infield, 4.9% (6/122) had suspicious lesion adjacent to the treatment zone, 7.3% (9/122) had a suspicious outfield lesion and 1.2% (2/122) had suspicious lesion infield and outfield. Compared with baseline, a decline of 61% in PSA at 12 months. Conclusion: To our knowledge this is the largest cohort of patient that have undergone primary IRE for localised clinically significant PCa. Our data supports the oncological benefit of IRE in men with localised disease. Nevertheless, further multi-centre trial with longer follow up are warranted to validate these results.